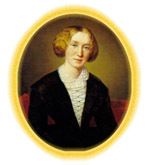 Greek myth is significant throughout George Eliot’s work, and is especially important in the characterization of Tito Melema. A particular identification with Dionysus or Bacchus begins early in the novel when Nello, after remarking that the newcomer seems to have come “straight from Olympus: (Ch. 2, 71), later finds that he resembles a young Bacchus or an Apollo (Ch. 4, 87). Further, the term “the stranger”, a common appellation of the god in the ancient world, where he was regarded as a foreigner from over the sea, comes when this stranger in Florence is frequently so called, often by the narrator throughout the first three chapters; indeed, the very first chapter is entitled “The Shipwrecked Stranger”. Even a year later, Bernardo still thinks of him as “the young Greek stranger” (Ch. 19, 248). Early in the novel again, a Bacchic association with the Via de’Bardi, presaged through an allusion to Nonnus’s Dionysiaca (Ch.5, 94), is confirmed whim Romola, expecting this new scholar to be middle-aged or elderly, is confronted with the handsome young Tito: her surprise “could not have been greater if the stranger had worn a panther-skin and carried a thyrsus” (Ch.6 6, 105). The panther-skin and thyrsus were traditional attributes of Bacchus; and Tito is once again “the stranger”. This parallel with Dionysus is maintained by Tito’s self-identification with the god through the portrait on the triptych, through his use of a recognized epithet of Bacchus when he calls himself Romola’s “Care-Dispeller” (Ch. 20, 263) and through the purple and red tunic he wears for his betrothal, reminiscent as it is of the multi-coloured garment associated with the god, reddish-purple in particular being one of the Bacchis colours. Further, in an allusion to the yoking of a lion and a boar to a chariot during the wooing of Alcestis (Ch. 13, 186), there is a reminder of the Dionysian chariot, traditionally also drawn by wild beasts, and Bacchus is yet again recalled when Piero di Cosimo thinks of the young man as “my Bacco trionfante” (Ch. 25, 297) and when, in the Rucellai Gardens, Tito sings a Bacchic chorus (Ch. 39, 420).